"Municipal Bond Coupons - Great Falls, Montana - 1931 - Set of 2." 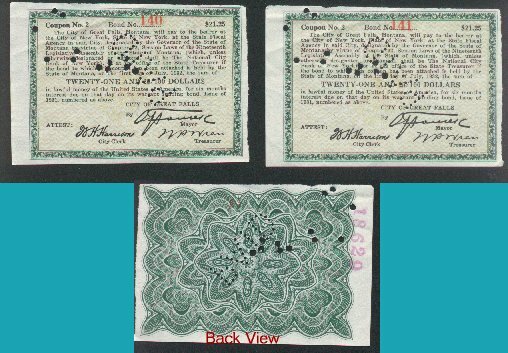 (1157) Municipal Bond Coupons - Great Falls, Montana - 1931 - Set of 2. - Condition: Excellent These two municipal bond coupons are in numerical order from 140 and 141. They were issued by the city of Great Falls, Montana for the amount of $21.25. Each bond measures 4" by 2 3/4", and has been validated. Copied Signatures on coupon include The Mayor and W.H.Harrison (City Clerk). Scan includes picture of the back of one of the coupons. Price: $5.00 (For complete set of 2 coupons) + Shipping.